In the 19th century, drinks such as lemonade, ginger beer and sparkling mineral water were sold in glass and earthenware bottles. To ensure that the drinks stayed fizzy they were sealed by glass marble-shaped stopper, a design patented by Hiram Codd in the 1870s. 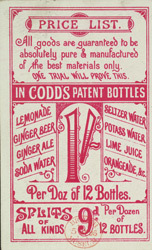 The bottles became known as Codd’s bottles and were especially popular with children, who would break the bottle to get hold of the marble. Many people were dismissive of soft drinks, preferring to drink alcohol. Beer was jocularly known at the time as 'wallop', so beer afficionados mockingly referred to fizzy drinks as 'Codd’s wallop'. A telegrammatic version of this term survives in the English language today ('codswallop'), meaning anything specious or misleading.